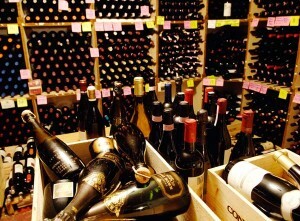 The world’s best wines await you in a hotel cellar in Voss. Our philosophy is that everyone should be able to afford a bottle of really good wine,’ says the sommelier at Park Hotel Vossevangen. That’s why we’re not interested in the multiplication table. We have a fixed mark-up on our wine, and don’t multiply by two or three like other restaurants do. This means that you can enjoy some of the world’s best and most exclusive wines at very reasonable prices at Park Hotel Vossevangen. Such reasonable prices, in fact, that word has travelled beyond Norway’s borders. A Belgian wine enthusiast drove from Brussels to Voss for the sole purpose of getting hold of a few precious bottles at Park Hotel Vossevangen. He was far from happy when he was told he couldn’t take them back with him. Park Hotel Vossevangen’s wine cellar has been awarded ‘Best Award of Excellence’ by the acclaimed Wine Spectator journal. Our Sommelier and hotel director Jan Bruse Andersen are happy to give you an introduction to the huge and diverse world of wine. Pretty much every good wine district in the world is represented in the cellar at Park Hotel Vossevangen. Around 70,000 bottles fill the ‘treasure chamber’ from floor to ceiling. So you should tread carefully! Up to 20 people are allowed into these sacred rooms at a time, and they then get to taste some of the precious gems. You can choose how many wines you would like to taste, and from what price class. You can, for example, taste a glass of champagne, two white and two red wines for a total NOK 500 and up per person. We adapt the wine tasting to all levels in the group. Some people may know very little about wine, while others are more knowledgeable. We adapt our wine tasting to the individual level so that everyone has a great wine experience no matter how discerning or inexperienced they may be. ou don’t need in-depth knowledge about wine to be able to enjoy good wine. This is precisely the point that Park Hotel Vossevangen wants to make: At Park Hotel, you can experience something new, taste something you’ve never tasted before and that few other people have tasted before you! You don’t have to worry about knowing about wine. ‘Many people think it’s difficult to tell the difference between different wines, but that’s generally because of the time that lapses between each time they drink different wines. Here you get to taste several wines right after each other, which makes it easy to identify the nuances and the differences between them. More and more companies are recognising the pleasure and benefits of the social aspect of wine tasting. Wine tasting is fun and interesting, and is just as much ‘teambuilding’ as anything else. Voss is a leading producer of lamb, which our guests will undoubtedly notice. Fantastic veal and beef are also produced in the district. We source fruit, berries and organic vegetables from local producers, honey from Voss and a variety of good, tasty Norwegian cheese. Although a lot of our food is inspired by France and Italy, we are keen to serve locally produced food at our tables. At Park’s restaurant, Elysée, you can choose between the à la carte menu or a set three, four or five-course menu that includes a wine package. ‘I dare to claim that Elysée’s wine list is the biggest and best anywhere in Europe. 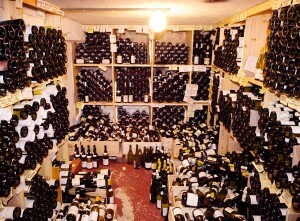 We also have a ‘bargain bin’, where bottles end up when we reorganise our collection. There are some real gems among the bottles in the ‘bargain bin’, so you can end up paying NOK 475 for a bottle of wine that is worth at least twice that. Jan Bruse Andersen and his wife Gro Andersen took over Park Hotel Vossevangen in 1979. Back then, the hotel had a ‘dining hall’. ‘We dreamed of having a restaurant. And to have a good restaurant, you need good wine. That’s why we started systematically buying wine, and we built up the wine cellar over a decade with the very best we could get hold off at a reasonable price,’ he says. Today, the wine cellar at Park Hotel Vossevangen has one of the biggest, best and most diverse collections of wine in Northern Europe. People come from Norway and further afield purely to enjoy our wine at Park Hotel Vossevangen. It’s great to see that people are becoming more and more interested in wine in Norway, and that we’re seeing more and more wine tourists. We’re constantly on the lookout for new wines, and want to make sure that the collection develops. And what would the hotel director recommend as a particularly good buy for wine tourists to Voss? ‘A well-matured Bordeaux of a 82–83 or 85–86 vintage – you get a lot of wine for your money, and it will definitely make you want to come back to Park,’ he promises. If you have any questions and comments or would like to see the wine list, send an e-mail to Jan Bruse Andersen.